Thanks, Jeff, for the photo link of the Sandy Creek! Not to be a nit picker, but the Sandy Creek and sister car Hickory Creek are Pullman Standard products built for the "All New 20th Century Limited" of the NYC railroad in 1948. It has the distinctive "Lookout Lounge" taller windows in the rear where the floor level was also elevated. 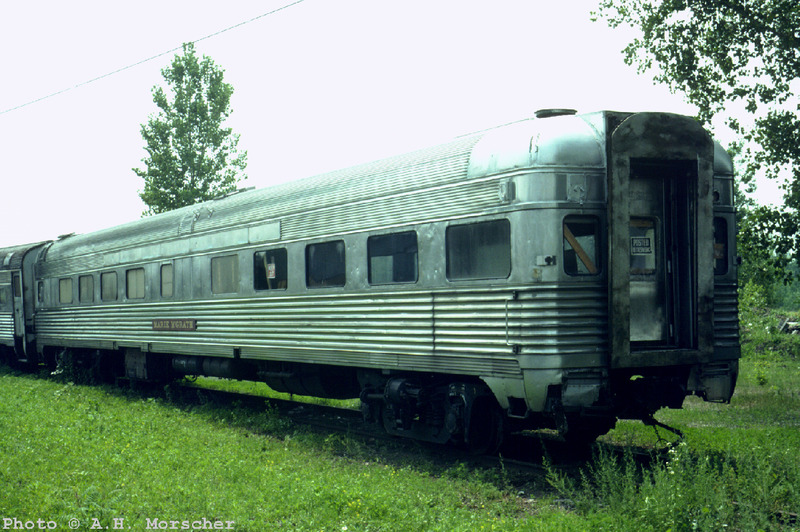 The first streamlined 20th Century Limited from 1938 had four PS round end obs cars in the "Island" series, Bedloes Island, Manhattan Island, Pelee Island and Thousand Island (?). I do not believe any of these survived. Nice to see Sandy Creek in fresh paint, but that is the most mismatched two tone gray paint I have ever seen (ha ha). Funny how things can stir the memory. An uncle of mine was an architect in the San Francisco Bay Area. At one point, he purchased a Budd observation from Amtrak that he planned to convert into an office in San Francisco. From what I recall, the car was stored in Los Angeles. It may have been of Seaboard (or ancestor) lineage before coming to Amtrak. Unfortunately, the car was the victim of a fire during storage. Anyone have an idea what car this might have been? Thanks! I'm not sure, but I think the Hobe Sound was scrapped by FEC. If I'm remembering correctly there's a book on FEC that mentions Hobe Sound being in the shop at the time of the big strike issue and was basically stripped down to its shell, after the strike it was disposed of for scrap. I'm not sure, but I think the Hobe Sound was scrapped by FEC. You are correct. The car was in the process of being converted to a smooth sided car for use on the City of Miami and had all of the Budd corrugation removed. Since the strike helped the line end nearly all of its passenger operations the car was scrapped instead of being finished. Thanks, Jerry, for the info on ACL #257! Thanks, Jerry, for the photo link! 7128 George Washington -- Denver Railcar? During one of EMD's open houses (1983? ), I distinctly remember seeing the "George Washington" in the La Grange plant. Now, seeing as how the George Washington seemed to move around quite a bit, I'm trying to figure out how long Dave Schumacher owned this car, and how this related to Denver Railcar owning the other car from this Lot, the Alexander Hamilton. Jeff Delhaye commented that the George Washington was at EMD in circa 1983. Could this actually have been the Benjamin Franklin, or was the Washington also owned by them at that time? Perhaps as a parts source for the Franklin? Or was it simply a case of the Washington, under private ownership, parked there for public display? In my notes, I have that the Washington was at one time a part of the collection of the Western New York RHS, and that it is now at Monad RY Equipment. The question is, does Monad actually own the Washington, or is it simply at their facility either in storage or undergoing mechanical work for a private owner? With the photo taken in 1998 (parked next to MILW Skytop parlor Cedar Rapids when it was still owned by William Nicholson), I'm wondering if this was the Washington, or the Hamilton before acquisition by Morristown & Erie. The Alex was acquired by Denver Railcar from the SP at auction. It was acquired by M&E at the big DRC auction in 2004. I believe the George was acquired by Dave Schumacher at the same SP auction, but my notes on that sale are not handy. Both the Alex and the George were at the SP West Oakland coach yard when sold. The George was not owned by EMD, and it was never owned by the WNYRHS. Monad acquired the George from Schumacher. The car in the picture with the Cedar Rapids is the George when Schumacher owned it. The George ended up being owned by Mrs. Monad after their divorce, and was sold to a Bill Wherry (sp?) from So CA. He later died and the car is now stored in AZ, owned by Bill's daughter. The Ben may still be owned by EMD but is rumored to be now at the Pueblo Test Center and may have been given to them. The Martha was on isolated track in PA for many years until bought by M&E maybe 8 - 10 years ago. To my knowledge it has not been rebuilt for service by M&E. The WNYRHS owns the former SAL 6500, pre-war blunt end obs coach lounge built 1940, ex Amtrak 3800. Thanks to Topfuel for the info, and to Jerry for the photo links! SAL 30 seat chair-stewardess room-24 seat buffet lounge observation (blunt end) #6500/SCL #5800/Amtrak #3800 (Budd, Lot #96515, 1940) was retired and sold to Western NY RHS in 1981, and in my notes I have it as renamed to Marie McGrath, while PRR Class PP85 buffet (galley)-29 seat parlor-5 seat DR #7135 Leonard Calvert/Amtrak #3635 (Budd, Lot #9628-110, Plan #9526, 1951) was retired and sold in 1977 to the Pittsburgh & Shawmut, and later went to the Western NY RHS as the Francis J. McGrath (#800415). It should be noted that Amtrak sold the George Washington and Alexander Hamilton to SP in 1977 in trade for several of the Class 66-B-2 economy baggage cars built by Pacific Car & Foundry in 1962, which had previously been under lease. Some source material lists that the cars sold to Amtrak were the #6710, #6714, #6716, #6720, #6730, and #6750, which were renumbered to #1010-#1015. However, Randall's "RPC Annual, Volume 5" (1980-1981) does not list the #6716/#1012. Amtrak had leased an additional 9 economy baggage cars from SP (2 from the St. Louis order and the remaining 7 were also PC&F cars: #6652, #6671, #6713, #6717, #6719, #6721, #6727, #6729, and #6733. RPC Volume 5 lists that a total of 10 cars were returned to SP, this would include the #6716. Rainier Rails posted this in the first summary, with the info on the Bay Biscayne probably coming from posts I had made earlier. I posted a correction fairly recently in the thread that included New Georgia Railroad equipment, but that correction hasn't made it here. Again, the car the SAM Shortline operates turns out to be the FEC Lake Worth, which did come to the SAM via Stone Mountain where it wound up after the New Georgia shut down. It had been purchased by New Georgia from CSX in late 1988 and the interior completely rebuilt for service on the New Georgia. FEC Lake Worth sold 1965 to SAL #6606 to SCL #5850 to Amtrak #3338 to unknown party to CSX to New Georgia Railroad (NGRX) #1508 Steve Polk (late 1988) to Stone Mountain (same) to SAM Shortline (SWGX) #1508 Samuel H. Hawkins (2002).